This one-off project took 1,500 hours to build. 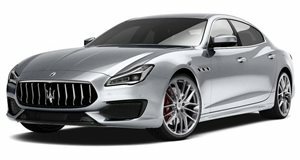 Maserati doesn’t sell a wagon version of the current Quattroporte sedan, but a wagon based on the last-generation Quattroporte was produced by coachbuilder Touring Superleggera. Only four were built, one of which was sold at auction in 2013. One British fan of the car was disappointed to have missed the car that sold at RM Sotheby’s auction, so they decided to commission their own based on the current-generation model. They approached several big-name UK coachbuilders to commission the project, who typically wanted to charge around £200,000 ($264,000) plus the cost of the donor car. The project would also take far too long, so they instead enlisted the help of Adam Redding, a bodywork specialist who has restored numerous classics including E-types, Astons, Lancias, Bristols, and Dinos. The sedan’s rear quarters were opened up and much of the roof removed. Other upgrades include a new trunk and a motorized power tailgate. After around 1,500 man hours, the one-of-a-kind Quattroporte shooting brake dubbed the ‘Cinqueporte’ was completed and the end result is simply stunning. It could easily pass as an official Maserati model. Redding’s creation is currently listed for sale by a dealer called Autostorico based in the UK. It’s a 2015 model with just 8,714 miles on the clock, and is finished in Gunmetal Grey metallic with Nero leather interior. Other features include 20-inch black painted Mercurio alloy wheels, satellite navigation, Bluetooth phone, heated seats, sunroof, front and rear parking sensors, reversing camera, keyless entry, keyless start, powerfold mirrors and piano black veneer. Under the hood is a 3.0-liter turbo diesel V6 that sends power to the rear wheels via an eight-speed transmission. The dealer hasn’t posted a selling price, but Maserati hasn't homologated the diesel model for the US market. Sadly, that means this one-off Maserati Quattroporte shooting brake can’t be imported to the US. A trip in a Maserati through the land where the world’s major religions all started will make you a true believer.